A rare rectangular iceberg has been found in Antarctica floating among sea ice just off the Larsen C ice shelf. 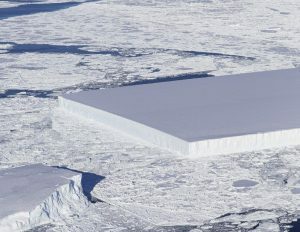 The huge, flat iceberg has perfect right angles in a unique geometric shape. NASA shared an image of the rectangular iceberg on social media, sparking considerable debate. The shape of the iceberg is an entirely natural phenomenon. Kelly Brunt, an ice scientist with NASA, said that the find was what is known as a ‘tabular iceberg.’ Tabular icebergs split from the edges of ice shelves and are wide, flat and long, like the top of a table. They also have steep, nearly vertical sides. When there is a clean split of the iceberg, the angles can be close to 90 degrees. The sharpness of its edges indicates that the iceberg formed not long ago. Over time, wind and water soften the sharp edges, giving the iceberg a less distinctive shape. The part visible above the surface could be as little as 10 percent of its mass. It’s unclear from the image whether the iceberg is fully floating or partially sitting on the ocean bottom. The iceberg was spotted by NASA’s Operation IceBridge, a mission to image the planet’s polar regions. The images will be used to understand how ice (thickness, location, accumulation, etc.) has been changing in recent years. Jefferson Beck, from the NASA Goddard Space Flight Center/USRA, revealed more details, including that the photo of the rectangular iceberg was taken at approximately 20:26 Zulu time on October 16th, location about Latitude: -66.8793 Longitude: -59.8820. Scientists are estimating that the iceberg is more than a mile across. Some tabular icebergs can be astonishingly large. The world’s largest recorded iceberg is Iceberg B-15, measuring 183 miles long and 23 miles wide.